This was something new to me, writing a comic strip, and it took a while to figure out the best way to plan it out in terms of art panels and text. In the end I sketched the whole thing out myself with stick figures so abominable I was forced to destroy it after I was done. The idea for this story came about when I was working on Codex: Witch Hunters with Andy Hoare and we were brainstorming ideas for the narrative hooks page. These pages were designed to give Witch Hunters reasons to fight other armies you might not obviously think they ought to and to give opponents of the Witch Hunters new toys and powers that made it more believable that the Witch Hunters were on the tabletop. One of the more obvious hooks was a rogue psyker rising to dominance on an Imperial world and leading its populace into rebellion. Cue the arrival of the Space Marines and Witch Hunters. This was a lot of fun to write and gave me a thirst to do some more comic work. 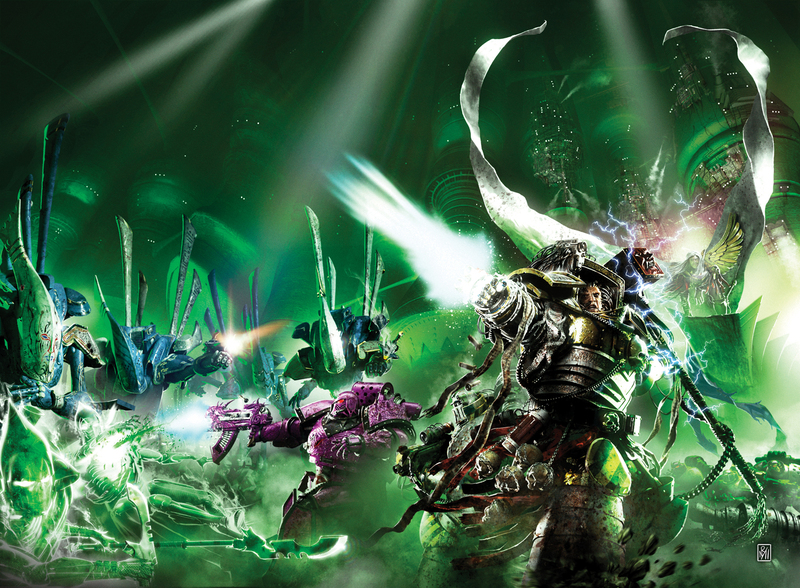 The story was significant in the development of Uriel Ventris as a leader, as it showed him that an Astartes didn’t have to think within the realms of the Codex to achieve victory.